Attracting over 9 million travelers a year, the Great Smoky Mountains National Park is the most-visited national park in the United States. And with good reason. This 187,000-acre wilderness mecca features breathtaking mountain views and seemingly infinite outdoor adventures at your disposal. All of this and more can be yours at these rustic yet elegant Tennessee and North Carolina resorts. Trek through the tree-lined national park, embark on an adrenaline-pumping whitewater rafting expedition, or just sway in a hammock with the mountain breeze blowing through your hair. And, with the cities of Gatlinburg and Pigeon Forge nearby, you'll be just a stone's throw from a vibrant downtown area featuring such attractions as Dollywood and Ripley's Aquarium. Whether you came for relaxation or recreation, the Smoky Mountains will pique your interest. With over 300 properties to choose from, American Patriot Getaways has a property to suit almost any need in Gatlinburg and Pigeon Forge. What brings you to the Smoky Mountains? Adventure? Relaxation? Whatever it is, American Patriot Getaways can accommodate you! From one-bedroom retreats to ten (or more) bedroom lodges, American Patriot Getaways offers you flexible options for your Smoky Mountains vacation. With special features like hot tubs, fireplaces, flat screen televisions, and stunning mountain views, each one offers the perfect touch of luxury while putting you in a stunning natural setting away from the crowd. Resting at the base of the Blue Ridge Mountains, this resort claims 1,400 acres of scenic landscape teeming with outdoor adventures. Whether you're tossing a line into the fish-filled waters of Hampton Lake, hiking through the mountain trails, or swinging away at the onsite golf course, you will be enamored with the mountain scenery. The resort's interior echoes the outdoor theme, as evidenced by the guestrooms' natural wood walls, twig and mountain-crafted furnishings, and in-room fireplaces. This resort is the definition of rustic elegance. Set in the lush, idyllic foothills of the Smoky Mountains, the aptly named Eden Crest offers rustic leisure and luxury. Experience heaven on earth at Eden Crest, where the surrounding natural sanctuary abounds with outdoor activities. Hike through the awe-inspiring mountains, stroll through Smoky Mountain National Park, or explore downtown Gatlinburg. The luxurious log cabins are a paradise of their own, offering hot tubs, saunas, fireplaces, and Jacuzzis. Flanked by the stunning Smokys and adjacent to rustic downtown Gatlinburg, Zoder's guests enjoy the best of both worlds! With its unique blend of homespun hospitality and gracious warmth, Zoder's is an ideal destination for any occasion. Explore the oodles of Gatlinburg attractions and experience beautiful Great Smoky Mountains National Park just minutes away. Both couples looking for a romantic weekend and families in search of a fun-filled getaway will find exactly that here- with a guest room or suite to suit your needs. Accommodations merge modern amenities with the comforts of home- it's unforgettable! Enjoy an amazing selection of cabins and chalets at Stony Brook Cabins in Gatlinburg, Tennessee! Stony Brook Cabins offers you a wide variety of rental properties ready and waiting to be your home away from home in the Smoky Mountains. Whether you need a one-bedroom retreat for your romantic getaway or six or more bedrooms for the family reunion of a lifetime, Stony Brook Cabins offers the selection you need to find the perfect lodging option. The Residences at Biltmore combine luxury and leisure to create the ultimate Smoky Mountain vacation! Experience the height of Smoky Mountain elegance at The Residences at Biltmore, an all-suite hotel perched atop a tree-cradled hill. Choose from a studio, one-, or two-bedroom luxury accommodation. Flat-screen televisions, whirlpool baths, private balconies, and gas fireplaces make you feel at home while the nearby mountains feature almost endless alpine adventures. Hike the mountain trails, soar through the sky with Asheville Hot Air Balloons, or stuff shopping bags at Biltmore Village! Nestled snugly between the majestic Smoky Mountains, Little Valley Mountain Resort provides cabin rentals for couples and families alike! Historic Pigeon Forge is the perfect place to stay if you're interested in a naturally-dedicated vacation, as it puts you in the middle of Tennessee’s mountainous beauty. The cabins themselves feature amenities go above and beyond a simple cabin rental, and each has its own private lot for unmitigated privacy. Rent one for absolutely any occasion, whether you’re traveling with friends, family, or looking for an uninterrupted romantic weekend with your significant other! Resting in a sea of swaying trees, you can hide from the stresses of everyday life and seek out mountain adventures at Hidden Mountain. With the Blue Ridge Mountains beckoning in the near distance, you won't be able to resist trekking through their rocky, flora-lined terrain. For some water-based fun, try fly fishing or whitewater rafting. You won't be able to hide from the city excursions of downtown Gatlinburg, including the ever-amusing Dollywood and the Mountain Mall. Luxury and leisure unite at Dollywood Cabins, where Smoky Mountain serenity and exceptional amenities make for an unforgettable getaway! Start off your stay with relaxation. The pristine peaks of the Smoky Mountains inspire tranquility as you relax on your private balcony. Seek exploration at the nearby Dollywood, the Dixie Stampede, and many other in-town attractions. If you prefer outdoor adventures, fun comes naturally hiking through the ruggedly beautiful trails of Smoky Mountain National Park. Your rustic yet refined cabin serves as your base camp for adventure, allowing you direct access to the wilderness and the city fun! Step inside The Lodge at Five Oaks and you'll be greeted by real hardwood floors, luxurious bedding, and hospitality fit for royalty! If you're in search of a rustically luxurious experience, look no further! At the Lodge at Five Oaks you'll spend your nights in a light and airy guestroom and when morning rolls around head out to see the sights! The surrounding Smoky Mountains are physically imposing and naturally glorious- make sure you check them out up close on a hike! When you return there's the flat screen televisions, modern walk-in showers, and free wireless internet- it's truly the best of both worlds! Located on the edge of the Great Smoky Mountains National Park, this resort is the optimum place to take in the majestic local wilderness. 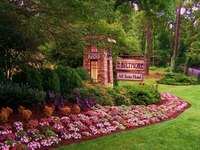 The Holiday Inn Club Vacations Smoky Mountain Resort aims to provide the ultimate Smoky Mountains experience. Take in the unforgettable vistas from the cozy confines of their suites and lodge inspired condos. The on site amenities might have you never leaving the resort with a fitness center, indoor and outdoor pool, whirlpool and many other activities. The resort has the perfect location for you between the park and downtown Gatlinburg, leaving almost endless options for entertainment. Interweaving luxury, outdoor adventures, and city excursions, RiverStone Resort & Spa captures the true spirit of the Smoky Mountains. Overlooking the rolling hills of the Gatlinburg Golf Course and cradled by the breathtaking Smoky Mountains, your eyes will be treated to a visual feast every morning. Appease your appetite for adventure with a white water rafting expedition or on a rollercoaster retreat to Dollywood. Feed your aching body with a variety of spa treatments and then satiate your thirst for shopping at Gatlinburg's Mountain Mall! Between the spectacular mountain views, hot tubs, and sublime accommodations, remember to sit back and appreciate Carolina Mornings! Carolina Mornings offers luxury rentals all over the Smoky Mountains, as exquisite located as they are upholstered. Whether you choose to stay in a captivating Blue Ridge Mountain chalet, a Smoky Mountain log cabin, an elegant downtown loft, or a luxury villa in Historic Biltmore Village, Carolina Mornings' staff will make sure your experience is unforgettable. With plenty free exclusive activities, personal attention, exceptional service and superior amenities, you'll never want to leave! With 25 separate luxury mountain cabins and spectacular natural vistas, Asheville Cabins of Willow Winds is perfect for any occasion! Asheville Cabins of Willow Winds is nestled in a 40 acre woodland garden adjoining the Blue Ridge Parkway and the Mountains to Sea Trail. Once you've settled into your comfy quarters, get out and take in Asheville's natural beauty! Enjoy the natural mountain stream, stocked trout pond, waterfalls, and 18 lighted fountains. Afterwards, you can get a workout in and get a little active with any number of activities! Whether your vice is hiking, biking, or even fishing, you'll find it in abundance! Smoky Mountain luxury and leisure combine at Watershed cabins, pushing your peak-side getaway to new heights! The adventures begin on the Nantahala River and Fontana Lake, where aquatic adventures like fishing, whitewater rafting, and boating abound. Test your luck at Harrah's casino or explore the Tsali mountain biking trails and the Great Smoky Mountains Railroad. Motorcyclists can explore the scenic "Deal's Gap." After and adventure-filled day, kick up your feet in a spacious cabin with amenities like soothing hot tubs, stone fireplaces, and sprawling decks. Roughing it has never been so luxurious!